I just wanted to share a great find. You do have to purchase separate socket boards as well as routing boards to support all the possible package configurations. The routing boards are just simple pin routing boards that sandwich between the socket board and the stk600 motherboard and gives you the correct wire mapping for the chip you are working with. 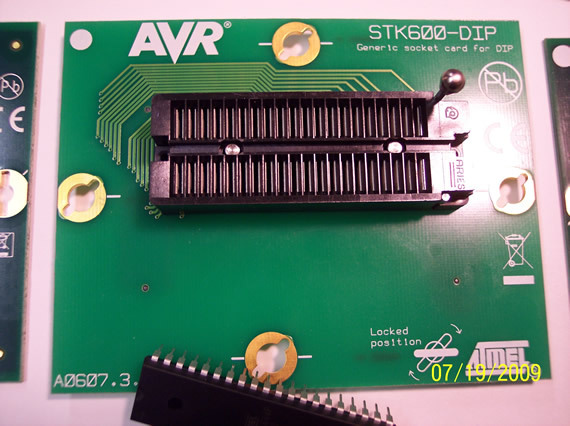 The extra boards are not that bad being I only use DIP chips and you need just one kit “stk600-DIP”. 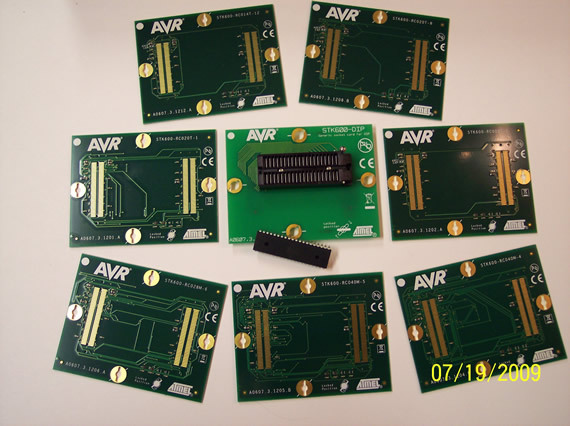 The “stk600-DIP” adapter kit comes with one DIP socket board with a ZIF and 7 routing boards. This DIP kit will support every Atmel DIP microcontroller except the ATtiny15 and ATtiny28 which requires two extra routing boards not included. They are: STK600-RC028T-3 and STK600-RC008T-7. 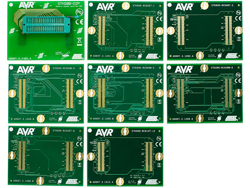 You have to buy the top socket boards but you can get the routing boards free by simply sending an email to your regional Atmel representative. My regional repersentive is David Fournier at Compass Marketing & Sales Inc. in Scottsdale, AZ. When I orded my stk600 I knew I needed the stk600-DIP kit, but Arrow wanted too much so I ordered the stk600-DIP adapter kit from Dig-Key for $99. This kit came with one ATmega32L, for testing I guess. I haven’t used the included ATmega32L for anything yet. So for just a little over $200 I have a great programmer, development and testing kit to use when I’m having issues. Frankly I was doing ok with my homemade PP cable for ICSP programming but it acted up sometimes, was flaky once and I just wanted to be able to program any Atmel microcontroller for testing smaller projects and for HV programming some bad chips in order to save them. 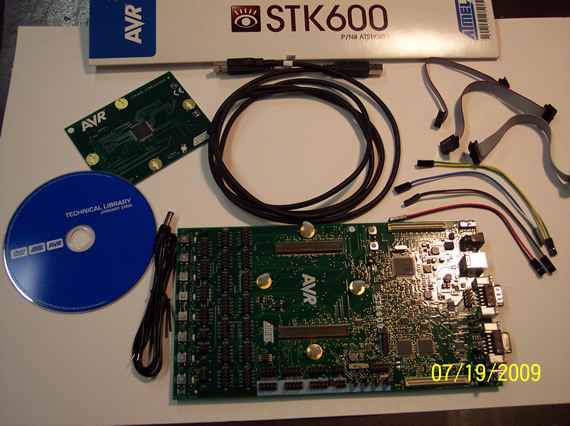 I read the stk600 manual cover to cover which was well written but the software that you use with it “AVR Studio 4” has a bad user’s guild really. So far I love the ability to pop a chip in the ZIF and see a quick description of the fuses (without going to the fuse calc site) as well as read and write the fuses. Of course it can program the chip in the ZIF as well as directly in your external project board like an Arduino using the 6pin or 10pin ICSP cable that comes in the kit. It’s super FAST too. When working with a chip on the stk600 dev board you can set your exact vcc voltage from “AVR Studio 4” making working with different voltage IC’s easy. After setting your fuses correctly to support your switch selection, this feature makes testing a raw chip easy and fast with different frequency configurations. Although I wouldn’t recommend doing a lot of high speed stuff with the chip in the ZIF do to all the wiring and routing going on. I would say the stk600 is a great dev tool to test from being it includes lots of pin outs, test switches and on board LEDs as well as usable serial port, USB port and a CAN port if you get into those types of chip communications. The feature list could go on and on, but that’s what the manual is for right? Ha. I don’t yet know how to use all of the stk600 features and truthfully I’m still mostly using the Arduino IDE with my PP ICSP cable to load my sketches.